On the left a nice lace up brogue, the right a Caterpillar boot. These shoes are pretty much interchangeable, both appear most often with jeans and a shirt, but they each make me feel completely different. The trusty Caterpillar, I’ve had a pair of those for around 15 years now, replacing them every few years with an almost identical pair. They are sturdy, warm, dry. When I put them on I am ready to get on with whatever the day throws at me, whether it’s walking miles, lifting furniture or sitting in a pub. They can go from dawn to dusk and not be cope with whatever the situation. The delicate brogues though, they change everything. They come out when I fancy a sartorial lift, I’m trying to make an impression or I want to smarten up. They are for evenings when I know the pub is my destination, or days when I need to be thinking a bit more professionally. I can wear the same outfit all day but change the shoes I’m a completely different person. The same is true of my runners. 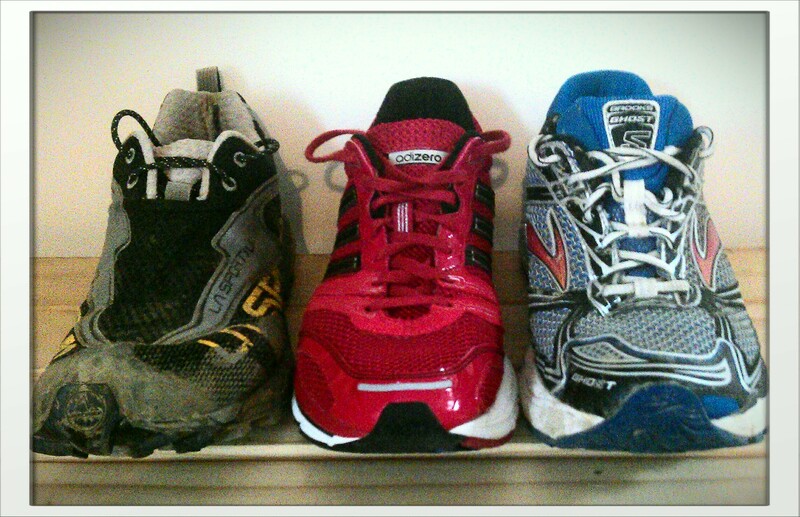 Above, from left to right, are my trail shoes, my ‘fast’ shoes and my long shoes. The shoes I’m wearing define the runner I am going to be that day. They will define my expectations, my pace, my approach. I can wear the same shorts and tops every time I run, but the shoes I wear determine the man I am going to be that day. Today I wore the blue ones, what have you worn? This entry was posted in Juneathon, Kit and tagged Juneathon, trainers. Bookmark the permalink.